Chloe Hannam at the British Championships. Day four of the British Swimming Championships in Glasgow was a day of celebration for City of Peterborough Swimming Club (COPS). 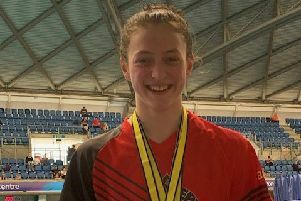 They had two of their swimmers appear in finals alongside Britain’s best and Chloe Hannam won a 200m backstroke bronze medal in a new East Region record time. Three COPS swimmers had qualified for the heats of the women’s 200m backstroke event and in the first heat 16 year-old Rachel Wellings was drawn in lane seven and Bethany Saunders (17) was drawn in lane five. After some good underwater work at the start, Wellings was the first to rise and was leading the field at 50m. She turned at the 150m mark still in the lead by just eight hundredths of a second, but she was reeled in over the last length to finish in second place with a new personal best time of 2:18.86 which earned her a place in the Junior Final. Saunders had been suffering with health issues in the weeks before the championships and she finished in last place in the heat having never got into the reckoning. In the junior final Wellings was drawn in lane seven and started well enough to turn first at the 50m mark. At the 100m turn she was placed third but she was unable to maintain her position to the end of the race and she finished in sixth place in a time of 2:18.01, which was another personal best time. Hannam (20) was drawn in heat five of six and she is not the best at starting a race. As a result of her start Hannam was placed third after the first 50m but at the 100m mark she had moved into second place although she remained a full second behind the leader. Over the next 50m she closed the gap by seven tenths of a second and she took the lead in the final 50m to finish in a new personal best time of 2:11.74. Hannam’s qualification time placed her in lane five next to the favourite Lizzie Simmonds, who has previously represented Britain at Olympic and World competitions. Again her start left her trailing the leader by over half a body length and at 50m she was in fifth place. In the next 50m Hannam pulled her position back to third place and despite a storming finish she had to settle for the bronze medal finishing in a new personal best time of 2:11.47, which is also a new East Region record. Earlier in the championships 16 year-old Mollie Allen had qualified for the 50m freestyle event where she was drawn in heat five of seven. She was up against world and Commonwealth competitor Lauren Quigley in her heat, while former World and Olympic competitor Francesca Halsall was competing in the same event. Allen’s underwater skills at the start set her off well but her finishing time of 26.48s was outside her personal best time and agonizingly placed her in ninth position meaning she had just missed out on an appearance in the Target Tokyo final.